#ad: This is a Compensated/Sponsored Post in collaboration with Amway and Latina Bloggers Connect, as always, all opinons are 100% my own, additional disclosure information below post. I've been an entrepreneur in some form or another for as long as I can remember, in fact I worked three jobs to get myself through College (in addition to several academic merit scholarships!). My original major was Biological Sciences (because I was pre-med and an aspiring Cardiologist at the time), but I was already a freelance writer contributing articles to a Bronx Newspaper (no, folks not just the Campus paper), and I ran my own Transcription and Translation Service, it started small and the word-of-mouth eventually landed me a Major Magazine Client whose editors would use both services, they would send me the tapes of the interviews editors would conduct with Spanish Speaking Celebrities and have me translate them because the magazine published articles solely in English at the time with some peppering of Spanish in some articles, so I would not only transcribe all interviews, (both the English and Spanish ones), but also translate the Spanish articles. It was my first lesson in just how long the hours are when you work for yourself. I would get a lot of 'overnight' turn around requests. Tapes would sometimes arrive to me via a messenger service up until 1 am (the latest time those services ran in my city) and I would have to translate, transcribe, proof read and get the tape returned and story sent to the editor hours later for same day rush service. Yes I was smart enough to charge additional fees for same day service and turn around, but I had to be up all night sometimes to complete those jobs. And still get up early for an office day job and a FULL TIME, NOT PART TIME class schedule. Was it easy? NO, not at all. Was I always tired? Indeed. While my three jobs were very different in scope they all taught me unique lessons that all specifically prepared me well for the future. They honed my discipline, my accounting skills, my time management skills, project management skills and client management skills. All skills you need in spades to turn your dreams of running your own business into a reality. It takes more than 'Ganas'/'Desire', it takes more than wanting it to make it happen. Yes butterflies if you can dream it, you can achieve it, I have NO doubt about that, but don't forget that it takes planning, research, in some cases additional education and it does take financial preparation. When you work for yourself, you will work way LONGER hours than you've ever worked for anyone else. Trust me when I tell you no day job you've ever had will ever compete with the amount of hours you will have to work when you go into business for yourself. Amway is partnering with various digital entrepreneurs to discuss and share our stories. They empower people everyday by enabling them to start a business, and they wanted us to share our perspective with being your own boss. Despite the fact this economy is still very much in a recession, it's exactly that reason that many people are exploring their options. Sometimes a 9-to-5 isn't quite enough to make ends meet these days and knowing that there are other options to empower yourself and your family is important. I for one think it's important to get first hand feedback from someone who is currently in a business, so I would suggest checking out the testimonials from happy Amway Family members including the Diaz Family, the St. John Family, the Avellaneda Family, the Veloz Family, the Kothapallis Family, and the Garcia Family. There are tons more! I personally think it's good business to allow folks to 'try the goods' you know 'sample the merchandise', and thankfully our friends at Amway agree, there is no better way to help people understand just how great your products are than by giving them the chance to try them out for themselves! 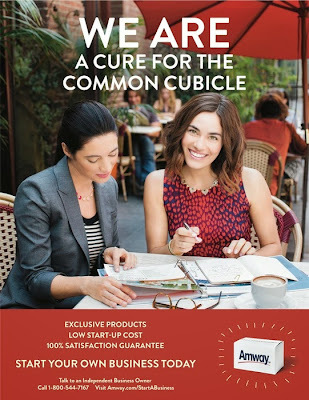 Amway wants YOU to do just that! The Approximate Value of this Prize Basket is $710.00! Can I get a Woot! Woot! Please note Ascending Butterfly is NOT drawing the winner, the sponsor is, so please check back after the contest closes to see the winner's name announced on the widget as I won't be posting a winner's announcement for this since I'm not drawing it. Tell us Butterflies, What part of the prize package interests you most? FTC Dislcosure: This is a Sponsored Giveaway in conjunction with Amway. All prizes are non-transferable with no cash redemption, equivalent or substitution except at Sponsor's Sole Discretion. Prize details and availability are subject to change and in the event that Sponsor is unable to provide a Winner with their Prize the Sponsor may elect to provide such Winner the approximate value of said prize in an alternate prize of comparable value. Prizes will be awarded via a random drawing and winners will be notified directly by Amway NOT by Ascending Butterfly. All Winners must respond to the notification within 24 hours or an alternate winner will be selected. Ascending Butterfly is NOT responsible for shipment of prizing, shipping fees or insurance, prizes will be fulfilled by Amway. Sponsor nor Ascending Butterfly will be held responsible for lost, late or mis-directed mail. Winners are responsible for any taxes on prizes awarded. Odds of winning are based on the number of participants during respective entry period. No Purchase Necessary. Prizes will be honored and shipped to winners ages 18 + who are United States Residents.